I was no end pleased when Peter Richardson decided to write a poem triggered by one of my own. I had written ‘braiding afield’ about a woman engrossed in braiding the wild long grasses near her home. to give us lessons in the minutiae of weaving grasses? Though his protagonist was observing the woman, he was also inside of the poem with his knowledge of what kinds of ‘grasses’ were being woven, the deep blue clouds over him, the thought that she might not finish the task before the clouds burst. He was inside the field yet outside it, looking at it from a different place, and trying to make sense of what she was doing. 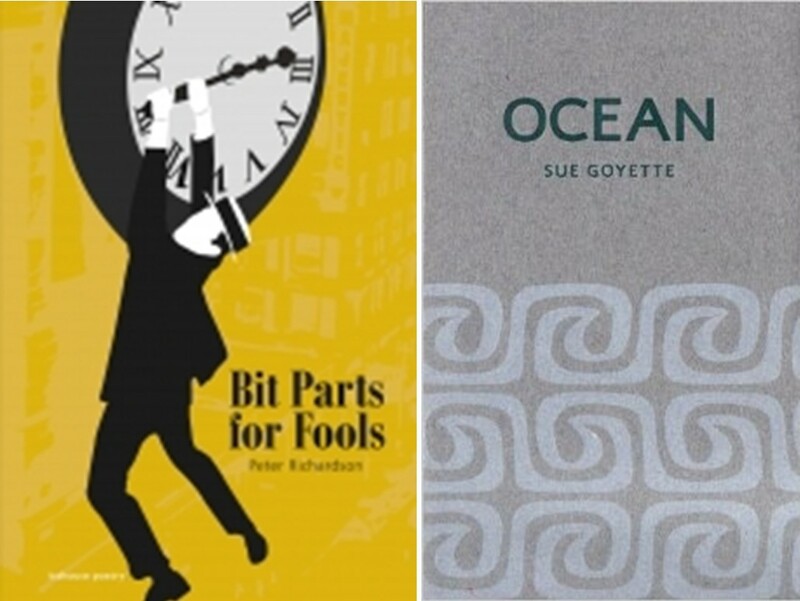 Using the same idea, I wanted to step inside the poems of Sue Goyette in Ocean (2014, Gaspereau Press) shortlisted for the 2014 Griffin Poetry Prize. It has been one of favourite collections ever since it came out. I read it through several times, beginning to end, reveling in her lush language, rich images, her sense of humour. But I wanted to know the poems more intensely, so I chose 13 of them, (along with writings by Lewis Carroll and Gary Geddes) for a chapbook Three Sets of Literary Haibun (2015, catkin press), held up my skirts, and sloshed inside of them one at a time. promises, the baked dream into its mouth. was thinking it would make us happy. The trick to building houses was to make sure they didn’t taste good. The ocean ate boats, children, promises and rants, even names. We tried to satisfy it―cooking cauldrons of sandals and sunglasses, quarts of bottled song. Our mistake/ was thinking it would make us happy, and isn’t that what nurturing is, why we feed people, not just our children, and why we celebrate with food. We want family and friends to be happy, and what better way to try to befriend such a strong and unpredictable neighbour. We make mistakes like this, think simple solutions, what will work in everyday situations, will work in all situations. In any case, you should get hold of a copy of Ocean, and spend time with each poem. You may be inspired to write a haibun from one of them. Or you may decide to use someone else’s work, and write a poem or haibun from inside it. For a look at haibun based on Gary Geddes The Terracotta Army, go five posts back to LITERATURE TO HAIBUN/ INTRO TO LITTLE LITERARY HAIBUN.